Fresh looking website, with great layout and up to date content. In particular we’ve focused on the new and used cars, offers and special events. Fast & accessible server – making sure important customers get the information they need quickly. Great statistics – Lead tracking, conversion tracking and website traffic monitoring. 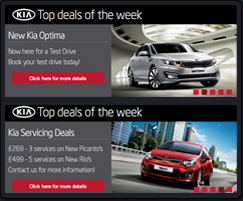 The website includes a bespoke design, kept in tune with the fonts and style of the kia.com parent entity. It also has influences brought from it’s parent franchise ‘Ken Brown Motors’ of which this dealer website is trying to break the shackles of and become more independent and in control of it’s own destiny. We also integrated the site directly with 2ndByte a service providing feeds directly from Autotrader and used by many dealerships up and down the country (funnily enough also owned by Autotrader). This allows the used car aspect of the site to run on autopilot with a fresh update from 2ndByte being dropped to our servers every morning. Ensuring our used cars are always up to date. The website also makes use of various content management tweaks such as adding used cars to the deal of the week and special offer boxes promoting exposure to vehicles which need to be shifted quickly. On a monthly basis we now look after intricate aspects of lead generation to the site and are chiefly responsible for driving cost effective traffic and potential leads to the website. Not only do we do that, but KIA on a quarterly basis release large wholesale price and specification changes to dealers, and subsequently the site needs to reflect these changes. So, after the information has been fed down to the dealers at the quarterly meetings, and then sent over to us, we update the entire website to reflect the new prices, specifications, offers, deals, new KIA car models and changes to any other KIA marketing aspects. Keeping the Dealers website up to date and making it more likely to be showing the most up to date deals and offers to potential customers. 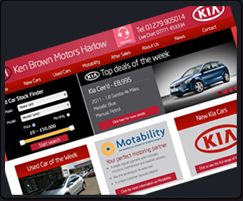 If you are a KIA dealer and your interested in the work we have done for Ken Brown Motors (Harlow) KIA dealership in Essex, and think it could be something your also interested in, then we’d love to hear from you – hello@bytewire.co.uk or 01621 85 66 28.